At the occasion of the 4th International Conference of the Consumer Citizenship Network CCN “Building Bridges” May 11, 2007. St. Kliment Ohridski University, Sofia/Bulgaria. In the early nineties of the 20th century Professor Nakahara took initiative to implement environmental education and citizenship education as essentials of Consumer Education. 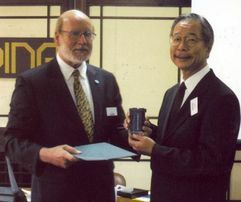 In his capacities as director of Japan Academy of Consumer Education JACE (from 1986 to 2002), executive director of National Institute on Consumer Education and chairman of Green Purchasing Network GPN (since 2001) he established worldwide cooperation by inviting international experts from USA, Great Britain, Germany and Korea to conferences in Japan. As an academic researcher and teacher at Musashi Institute of Technology, and in his publications, recently in his book “Consumer Life” (Tokyo 2005; edited by the Ministry of Science and Education), Prof. Nakahara promoted his holistic concept successfully in theory and practice. The TOPACE Jury has evaluated and acknowledged his innovative and continuous contribution to the modernisation of consumer education in Japan and unanimously decided to award Prof. Hideki Nakahara for his outstanding merits.